Approved Driving Instructor lessons are €55 an hour. For an average student who is prepared to study and do the necessary practice in their own time, the total course should take approximately or less than 30 hours on a one-to-one basis for Part 2 and Part 3. There will never be more than one to one tuition at all times. 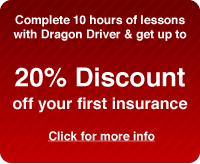 RSA fees are not covered by the Dragon Driver fees which are based on 30 hours are €1,650 or less if the student comes up to standard quickly. Your budget for total costs which includes RSA Fees and Dragon Driver Fees as above of at least €2,550 which includes Trainee Licence (€100), if required. In order to become a driving instructor you must have held an EU driving licence in the Category you want to teach for a minimum of 2 years. The course is split into 3 distinct stages, the Theory Test, the Driving Test and the Instruction Ability Test. The student sets the pace and decides when they wish to take the exams at the different stages. The course must be completed in 2 years from the date of passing the theory test. Each stage must be passed before the student can go on to the next. Once the driving test stage is passed the student must decide if they want apply for a Trainee Licence or go straight on to take the Instruction Ability Test. The ADI course follows the syllabus set out below by the RSA. Stage 1 – Theory Test. Driving Techniques and handling of vehicle controls. Dealing with Pupils who have physical disabilities and familiarisation with common vehicle adaptations. Stage 2 – Driving Test. That the sponsoring ADI will maintain a record of all training given under his/her supervision. The Trainee Licence is granted to allow an applicant ADI to develop his/her teaching skills in preparation for the teaching ability (Stage 3) test. The sponsoring ADI may only have one trainee under his/her supervision for the duration of the Licence. A minimum of 20% of the training given by a Trainee Licence holder must be under the direct supervision of the sponsoring ADI. The Trainee Licence must be clearly on display in the vehicle during all tuition sessions, whether or not the trainee is being supervised at the time. At the end of the six-month period of the Trainee Licence, it must be returned together with the training record to the RSA. This examines the ability of the ADI candidate to deliver tuition/coaching to the novice driver relevant to the level of skill and experience of the driver. The RSA examiner will take you through the administrative procedures before accompanying you to your vehicle. S/he will then explain the format of the test and explain that s/he will be adopting the role of a learner driver under instruction. Once in role the examiner will stay in role until that phase of the test is over (the examiner will tell you when the phase is complete and s/he is coming out of role). If an emergency arises during the test the examiner will immediately come out of role. Phase 2 also examines the aspects above, however the expected level of delivery will be at the level of learner (driving test standard) driver. During all of stage three a candidate will be expected to give clear directions in good time and these instructions must be related to the prevailing road and traffic conditions. Language used must not be over technical and jargon should be avoided; the learner must clearly understand any necessary technical terms used. A driving instructor should use simply worded questions to clarify with the learner that the message is being received. The questions must be related to the objectives of the lesson or prevailing conditions. An Instructor must summarise the main points at the end of a lesson, and look forward to the next session setting any appropriate homework/study or revision work that will feed into the next lesson. At the end of the second phase the examiner will tell you that s/he is coming out of role and that you have now come to the end of the test. You should receive your result of stage 3 within five working days. You should budget to earn in the region of €20,000 to €25,000 Gross in the first year, if you are committed, have a web page and advertise with someone like www.Roadready.ie. You could better your turnover by joining a franchise group, some groups give figures in excess of €45,000 per year as potential earnings, but be careful to what you are signing yourself into. Excluding the ADI application pack, all of the above are supplied by Grade Six Supplies and are included in the book price of approximately €250.You should familiarise yourself with the contents of the Learner-Driving Test Report Form.